The Road Venture APT KL51 is built to navigate city streets and highways in all-season conditions, and venture off-road with amazing all-terrain agility. 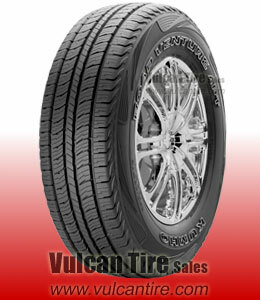 Kumho offers a 60,000 mile limited treadwear warranty the Road Venture APT. I love these tires. I have had them for over a year and a half and have had no problems so far. They were delivered really fast and the gentleman on the phone who took my order was really polite and helpful. I even got a really good price. The next time I need to buy tires I already know where to go! Will never buy again. Very hard to keep balanced. Had to get the tires balanced 3 times the first month. Makes my silverado ride a lot rougher. Should have spent the extra $$ to get the Yokohama Geolander. There's really nothing spectacular about these tires. I'd buy them again, but I wouldn't say they're the only tires I'd buy.